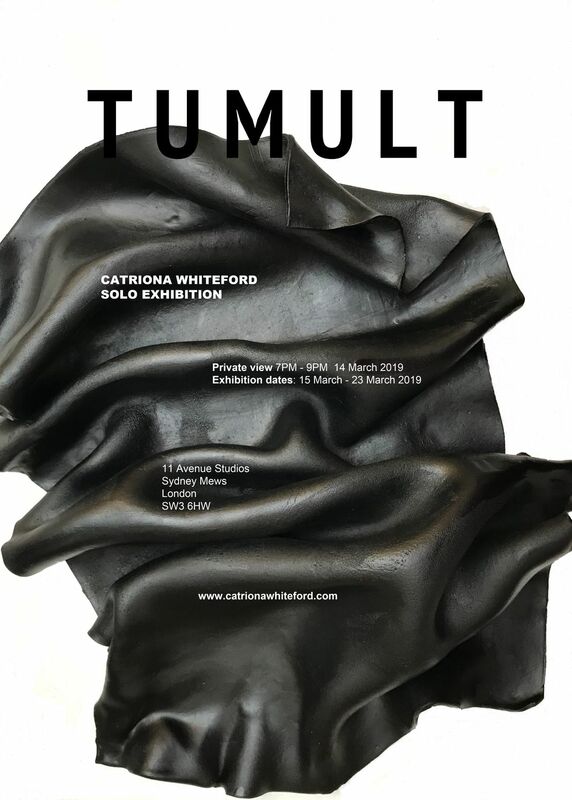 TUMULT is the first solo presentation of work by Catriona Whiteford. The exhibition brings together new sculpture and print produced in response to the exploration of memory, insomnia and counter-consciousness. Central to the exhibition is a large-scale sculptural installation created using a flexible concrete impregnated fabric. The sculpture drapes and swells from the walls of 11 Avenue Studios, confronting viewers with the contorted, continuously shifting movement adopted by fabric. This quiet conflict between stasis and flux is closely related to the artist’s interpretation of sleep as an empty promise, an attempt to unlatch from consciousness. By creating structures reminiscent of active conflicts through notions of comfort and discomfort, the exhibition suggests moments of vacancy; relief, absence, presence and the contortion of objects from their original intentions. As with previous work, Whiteford explores areas of unconscious and conscious positions and physical space as something simultaneously active and dormant. This exhibition is kindly presented by 11 Avenue Studios as part of their 2019 Programme.